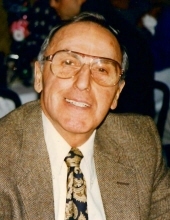 Russell R. Attis was born August 8, 1923 in Elkhart, IN to Frank and Theresa (nee Albano) Attis. He died March 16, 2019 at the Abington of Glenview. Mr. Attis received his undergraduate degree in physical education in 1945 and his Masters in education in 1946 from the University of Illinois where he belonged to the Tau Kappa Epsilon fraternity. After graduating Mr. Attis taught at the University of Illinois for one year (Urbana and Navy Pier Campus’), Chicago Public Schools for two and a half years and later at the Northern Illinois University. He retired in 1984 after 34 years of coaching and teaching at Arlington High School. He was the Director of Athletics at time of his retirement and had taught physical education, health and drivers education. During his tenure at Arlington Russell was head coach of the Varsity boys track and cross country teams and Varsity girls track. He served as an official at the Illinois Boys State Track meet for 24 years. In 1978 Russ was named Athletic Director of the year by the Illinois Athletic Director’s Association. His impressive career includes 14 years as a member of the Lattof International YMCA Board of Directors. He was a member of the Des Plaines Elks Club, Arlington Heights Optimists Club and a long time member and usher at St. James Catholic Church. Charter Member of Oak Park Ski Club. Russell is survived by his nephews Frank (Susan) and Anton Ursini; his great nieces Caitlin, Meagan (Andrew) Dimit and Tess Ann; his God daughter Susan Kubik. He is preceded in death by his sister Dolores Ursini; his long-time friend Phil Podulka to whom he was best-man and a childhood friend and by his parents. Visitation Wednesday, March 20, 2019 from 4:00 PM until 7:00 PM at the Glueckert Funeral Home, Ltd., 1520 N. Arlington Heights Road, (4 blocks south of Palatine Road) Arlington Heights. Funeral Mass 10:00 AM, Thursday, March 21, 2019 at St. Edna Catholic Church, 2525 North Arlington Heights Road, Arlington Heights. Interment All Saints Cemetery. In lieu of flowers, memorial contributions may be given to Mercy Home for Boys & Girls, 1140 W. Jackson Blvd., Chicago, IL 60607 www.mercyhome.org. "Email Address" would like to share the life celebration of Russell R. Attis. Click on the "link" to go to share a favorite memory or leave a condolence message for the family.